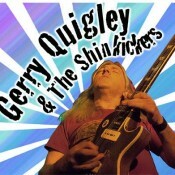 If you could combine the sound of Gary Moore, Rory Gallagher, Eric Bell and Paul Kossoff with the madness of Jimi Hendrix, you would have blues/rock guitar virtuoso Gerry Quigley and his band! Original progressive celtic rock, rock & blues, with some of your favourite 70’s rock classics! Prepare to be captivated – madness is also possible! “I’ve never seen so many jaws hit the floor at once when Gerry started playing” – comment seen on facebook following Gerry and the band’s debut at Ballyshannon International Rory Gallagher festival 2016. A jaw-dropping performance is guaranteed!